Japanese rescue workers with bulldozers and sniffer dogs scrabbled through the mud Friday to find survivors from a landslide that buried houses after a powerful quake, as the death toll rose to 20. Around 20 people are still unaccounted for in the small northern rural town of Atsuma, where a cluster of dwellings were wrecked when a hillside collapsed from the force of the 6.6-magnitude quake, causing deep brown scars in the landscape. 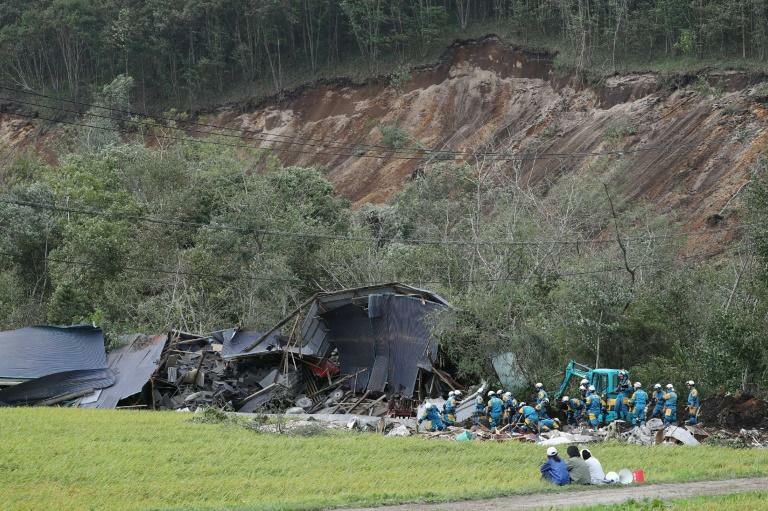 Atsuma resident Tenma Takimoto told local media that his 16-year-old sister, father and grandmother were caught in the landslide. "It was my sister. She had a beautiful face," Takimoto said after confirming her identity as the body was sent to a hospital. "All I feel is regret, but we shared so many happy memories. I will live my life remembering that," he told Hokkaido Cultural Broadcasting. "I'm still lucky she was found," he added. A member of the Self-Defense Forces in Atsuma told public broadcaster NHK rescue efforts were "difficult". "We've heard there are people still stuck under the mud, so we've been working around the clock," the serviceman said. "We will take measures to find them quickly." 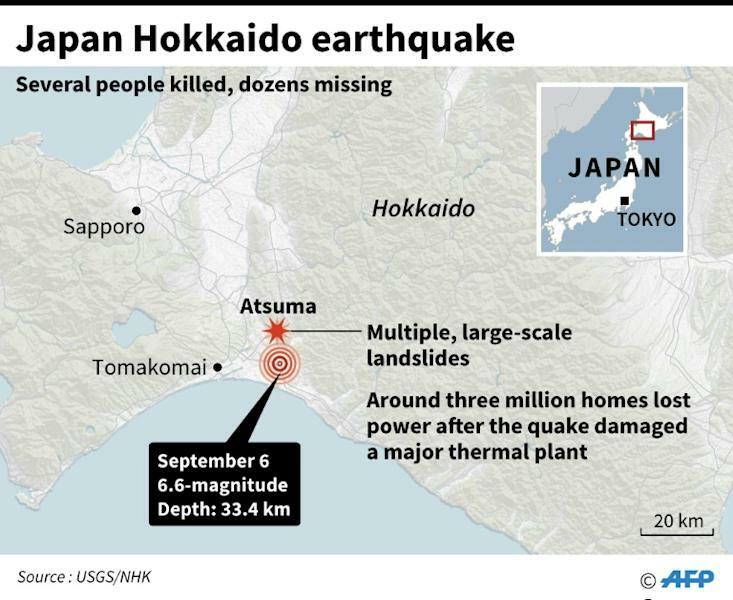 Around 772,000 households in the sparsely populated northern island of Hokkaido were still without power after the quake damaged a thermal plant supplying electricity to the region. Industry minister Hiroshige Seko said that all households should have power by the end of Saturday. But amid continuing power shortages, he urged citizens to conserve energy by using fewer lights in shops and restaurants and "for example family members staying together in one room". Some 22,000 rescue workers including troops handed out emergency water supplies and long lines formed at petrol stations and supermarkets, as people stocked up fearing further quakes. "Please give your sympathy to people who spent a dark night in fear, and do everything you can to restore electricity as soon as possible," Prime Minister Shinzo Abe told a cabinet meeting to discuss the quake. 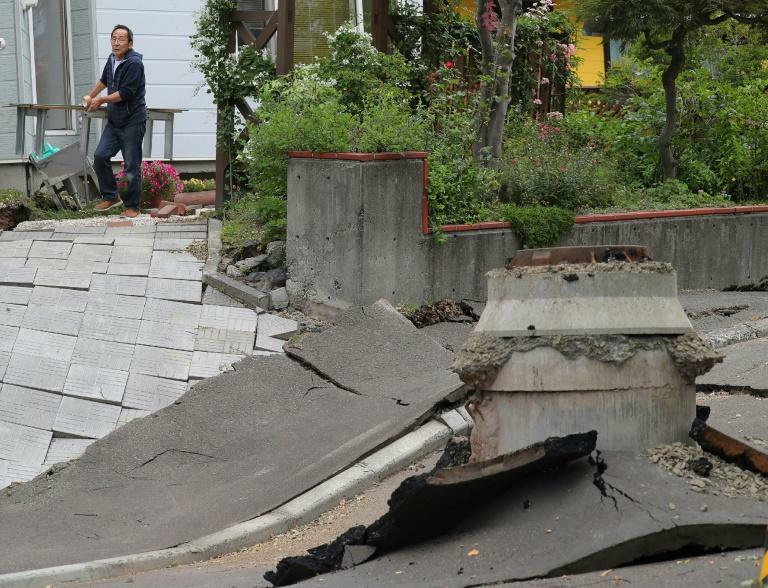 The earthquake, which scored the maximum on a Japanese scale measuring the power of a quake's shaking, also collapsed a handful of houses and walls in the main regional city of Sapporo. Japanese auto giant Toyota said it will halt all the car production lines across the country on Monday after its plant in Hokkaido making car parts was hit by power outage. Officials also warned of the danger of fresh quakes. Toshiyuki Matsumori, in charge of monitoring earthquakes and tsunamis at the meteorological agency, warned risk of housing collapses and landslides had increased, urging residents "to pay full attention to seismic activity and rainfall and not to go into dangerous areas". Japan sits on the Pacific "Ring of Fire" where many of the world's earthquakes and volcanic eruptions are recorded.